An intensely nourishing conditioner to hydrate, soothe and help strengthen hair, leaving it smooth, glossy and in beautiful condition. Coconut, Jojoba and Olive Oil nourish, leaving hair soft, shiny and easy to style, while Protein-rich Soy, Wheat and Corn Extracts ensure hair is revitalised and lustrous. Silicone, SLES and SLS free. Suitable for all hair types, including colour-treated hair. After washing your hair with Purifying Shampoo, follow with Nourishing Conditioner. Gently massage into damp hair and scalp, comb through and leave for two minutes before rinsing. For an extra nourishing boost, apply Pink Hair and Scalp Mud to hair and leave on for 20 minutes before rinsing. Water (Aqua), Cetearyl Alcohol, Glycerin, Cetrimonium Chloride, Limonene, Phenoxyethanol, Cocos Nucifera (Coconut) Oil, Olea Europaea (Olive) Fruit Oil, Panthenol, Prunus Amygdalus Dulcis (Sweet Almond) Oil, Simmondsia Chinensis (Jojoba) Seed Oil, Citrus Aurantium Dulcis (Orange) Peel Oil, Citrus Limon (Lemon) Peel Oil, Cupressus Sempervirens Oil, Citrus Aurantium Bergamia (Bergamot) Fruit Oil, Caprylic/Capric Triglyceride, Citrus Aurantifolia (Lime) Oil, Eucalyptus Globulus Leaf Oil, Lavandula Hybrida Oil, Linalool, Ethylhexylglycerin, Abies Sibirica Oil, Mentha Arvensis Leaf Oil, Myristica Fragrans (Nutmeg) Kernel Oil, Zingiber Officinale (Ginger) Root Oil, Hydrolyzed Corn Protein, Hydrolyzed Soy Protein, Hydrolyzed Wheat Protein, Citral, Cupressus Sempervirens Leaf Oil, Cymbopogon Nardus (Citronella) Oil, Melaleuca Alternifolia (Tea Tree) Leaf Oil, Myrocarpus Fastigiatus Oil, Pogostemon Cablin Leaf Oil, Citric Acid, Cistus Ladaniferus Oil, Dipteryx Odorata Seed Extract, Ferula Galbaniflua (Galbanum) Resin Oil, Fucus Vesiculosus Extract, Jasminum Grandiflorum (Jasmine) Flower Extract, Lavandula Angustifolia (Lavender) Flower Extract. Plus, enjoy complimentary Next Day Delivery on all UK orders. *Exclusions apply. Gift automatically applies at basket. 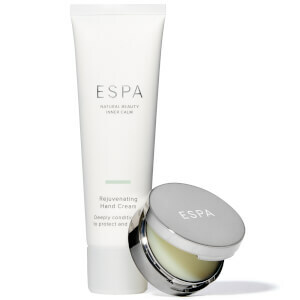 Feels nice to use but compared to previous espa i have loved - this feels a bit less luxurious and need to apply more. Not complaining - its still lovely!! I was surprised by how much I liked these products. I bought the shampoo and conditioner. Bit of a price tag rgh but actually worth it! I have fine blonde coloured hair that can be weighed down by all products...not these. The colour stays fresh and not brassy throughout the day. Def be buying again. Leaves hair soft and shiny . The smell is so nice and fresh . A real treat for your hair. I buy the shampoo and conditioner regularly and absolutely love them both. It smells divine and the conditioner is very nourishing and great on my very fine hair. I consider this a game changing product. I stumbled across the shampoo and conditioning products when I was staying at an ESPA spa hotel. Showering after the gym I used the product available. I can honestly say my dry, curly, gym and swimming abused hair has never been so soft, nor in such good condition. I absolutely attribute it’s new found vibrancy to the ESPA hair care line. I am now a life long customer. My only criticism .... the pump is very small for someone who has very long hair as it takes me a while to get at the product. So much so, I have taken to unscrewing the lid to access to it quicker. I consider this a game changing product. I stumbled across the shampoo and conditioning products when I was staying at a ESPA spa hotel. Showering after the gym I used the product available. I can honestly say my dry, gym and swimming abused hair has never been so soft and in such good condition. I absolutely attribute it’s new found vibrancy to the ESPA hair care line. I am now a life long customer. My only criticism .... the pump is very small for someone who has very long hair as it takes me a while to get at the product. So much so I have taken to unscrewing the kid to get access to it. Started using this last year. As a 68 yr old, my hair was beginning to feel and look very fragile, especially after high lightening it for over 20 years. I use this with the matching shampoo and my hair has never looked or felt better. My husband is now stealing it! The Nourishing Conditioner is a wonderful product that delivers amazing results for healthy and shiny looking hair. It nourishes and revitalises my hair and also prolongs my hair colour and prevents split-ends. 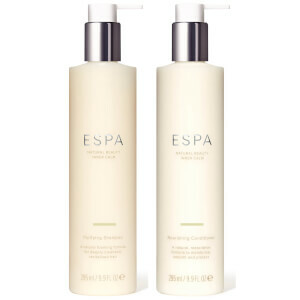 I use the Nourishing Conditioner with the Espa Purifying Shampoo. This two products together work miracles even on the most processed and tired looking hair. I highly recommend the Nourishing Conditioner Thank you very much for the excellent customer and delivery service, I am very grateful.